Superdrug appear to be investing quite heavily in their skincare offering at the moment, most recently with the introduction of the Naked Truth range﻿. This follows on from the hugely successful Superdrug Optimum Swiss Apple Overnight Skin Renewal Serum which was launched in August last year, becoming an instant sell out. It was the store's bestselling anti-aging serum in 2010 and has sold approx one hundred thousand bottles to date and now, Superdrug has added Swiss Apple Skin Renewal Day Cream to the line up. 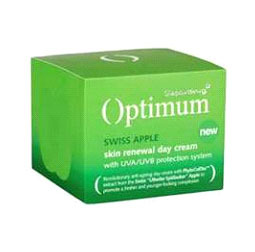 Superdrug Optimum Swiss Apple Skin Renewal Day Cream launched earlier this year, in March and I was sent a sample to try. The cream is based on the same Apple Stem Cell "wonder ingredient" as the original serum, along with the addition of moisturising Hyaluronic Acid and UVA & UVB filters, however, I was a little unclear on exactly what level of sun protection, if any, is actually provided. My first impression was that the packaging looks and feels much more expensive than I had anticipated. The velvety texture is also suggestive of a more expensive product, with only a minimal amount required to leave skin feeling smooth. Whilst many may expect the scent to be of apples, it's not, however, it's pleasant and a more grown-up fragrance than a fruity element would provide. I haven't noticed any miraculous results, however, I have enjoyed using this cream & feel that the overall texture of my skin has benefitted. If you're looking for a starter anti-ageing product and don't yet need the targeted ingredients or the price tag of more specialised products, I'd say this is a good option. If you're thinking of trying Superdrug Optimum Swiss Apple Skin Renewal Day Cream, here's a hot tip for you... invest now when the cream is offered at the introductory price of £9.99. From 11th May, the price will be increased to £12.99.